The blog’s been quiet. You thought I’d been eaten by a bear didn’t you? Well, sorry to disappoint. 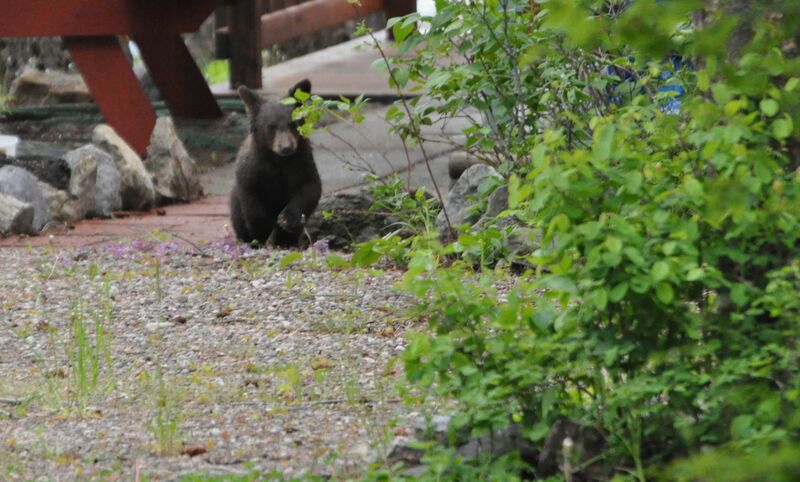 Granted, it was a summer of many bear encounters, but I managed to survive all of them intact, at least physically. This year, we arrived in Montana before summer did and proceeded to suffer through the cold, damp weather that lingered well into June. It was rather quiet around Flathead Lake, as the rain kept “the summer people” away. However, the weather seemed to have the opposite effect on wildlife. And since there was a dearth of loud, badly-dressed, RV-driving tourists to scare them away, they seemed to make themselves at home. The fox strolled by at will, the deer ate every flower in sight, and we even spotted a mountain lion. The bears, though, were the most punctual visitors. They showed up like clockwork on Tuesday mornings. Why Tuesdays? Well, because that’s garbage pick-up day, of course. Now, I spent the better part of a decade living in a densely populated town just outside of Boston, MA, and we had to take our garbage to the dump. No curbside service there. Ah, I have such fond memories of laying out the tarp in the back of the car, in case the bags leaked something disgusting, then driving over to the dump with the windows wide open, even in sub-zero temperatures. Good times, they were. So imagine my surprise to find that in rural Montana, one of the most sparsely populated states in the country, we don’t have to haul our garbage to the dump. No, for a small fee (gladly paid), someone comes to our home and takes our garbage from the end of the driveway. Of course, that’s only if the bears don’t get to it first. The trash, I’ve discovered, is like a siren calling to bear near and far. Come visit! We have pizza crusts, barely nibbled chicken wings, and apple cores! We even have grapefruit rinds, a surprisingly popular choice, based on my observations of what gets eaten the most. Maybe The Grapefruit Diet is all the rage in the bear world these days? I pride myself on being undaunted by wildlife. After all, I grew up in suburban Connecticut, an area known for it’s wildlife: squirrels, chickadees, Golden Retrievers. Some neighbors even had (gasp) mixed breed dogs. What’s more, once, at a tender age, I saw a show horse whose mane was left unbraided. Barely even brushed. Clearly, I have some experience with wild beasts. So, I know that the rule of thumb is “leave them alone and they’ll leave you alone.” Mountain lions are shy, wolves stay far away, and bear for the most part will back off if they hear you coming. 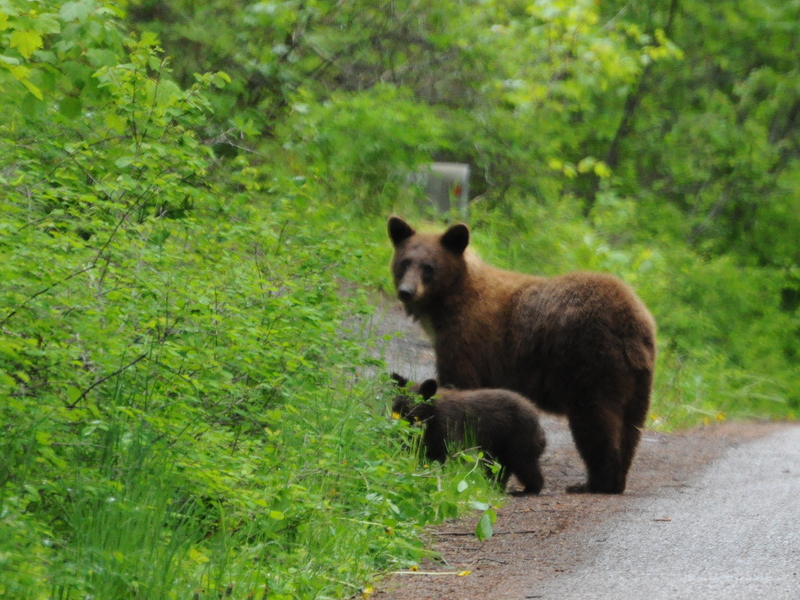 But there is one thing that scares me: a momma bear with her cubs. And this year, we had not one, but two sets of sows with two cubs each roaming up and down our lane. That’s a lot of bear per square mile. What’s more, I noticed that one of the cubs was a bit adventurous. He tended to wander off (and I’m assuming it’s a boy, because let’s face it, toddler boys are known for ignoring their mothers and chasing whatever object catches their eye). And that’s a recipe for disaster. The last thing I needed was to be running along the lane and inadvertently get in between Scout Junior and his mom. Because the mom wouldn’t scold Junior and send him to bed without supper. No, she’d turn her mommy wrath on me. Which is exactly what happened to this runner down in Missoula. So what’s a runner to do? I fretted. I was perplexed. What was the best way to protect myself from inadvertent bear encounters? I finally decided the answer was simple. No running on Tuesdays. Put the garbage out then lock the door and stay in the house until the Ursas Americanus moved along to the Wednesday trash pickup neighborhood. While it meant re-configuring my long run days and rest days, I decided that No Running On Tuesdays was the the right plan of action. And no more using that grapefruit body wash, that’s for sure. At least until the bears move on to a new fad diet. "Where in the world is your brother?" OMG, something I definitely don’t have to deal with in the suburbs of Los Angeles County. Wow. Sheila, I’m sure you have your own hazards! Distracted drivers on cell phones, perhaps?